This late September, through until mid-November, ballet dancer Carlos Acosta has made a return to the stage, this time as the director of his own company, Acosta Danza. Arguably the greatest dancer of his generation, Acosta retired from the Royal Ballet in 2016, returning to his native Cuba. This was the country that inducted him into the world of dance, allowing him to escape the slums of Havana, and live out a career touring the world to dance with all of the greatest companies. The desire to give back all he has learnt from the people he has met along the way is understandable. And so, Acosta Danza was born – a new company for Cuba, supported by the Cuban national government and with international backing from London’s Sadler’s Wells. The cast are all Cuban and mostly trained in the country, with many having previously danced for the Cuban National Ballet. Where for a long time Acosta was the only black principal dancer at the Royal Ballet, his own company celebrates a broad range of ethnicities with remarkable aptitude. Debut is the UK Premiere for the company and acts as a showcase of this talent Acosta has handpicked from across his country. Act One comprised of two works created for other companies and added to the Acosta Danza repertoire in early 2016, having been first performed at the Gran Teatro in Havana, the company’s home turf. The first piece, ‘El Cruce Sobre El Niagara’ (The Crossing Over Niagara), was created in 1987 by Cuban choreographer Marianela Boan. The piece was inspired by Charles Blondin’s actual crossing of Niagara Falls by Tightrope, a feat he accomplished numerous times to great applause. The opening sequence invoked a sense of trepidation as one of the two male dancers moved slowly, and with slight imbalance, downstage, guided by a gradually appearing path of light. As the piece progressed, the dancers began to move in sync, with each movement emphasising their sinuous physiques. ‘Les Belles-Lettres’ was a light and romantic piece in a neo-classical style with four couples in wafting across the stage, evoking A Midsummer Night’s Dream, appearing to be charmed by a Puck-like figure into re-coupling and reuniting. This was the most traditional piece of the evening and acted as a light contrast to rest of the programme, and a nod to Acosta’s roots in classical ballet throughout his 30-year career as a dancer for the Royal Ballet. The second act housed three pieces premiering with the company, and really drove home their capacity, emphasising how much has been in achieved in the short two years since the company’s founding. ‘Imponderable’ featured the music of Cuban musician Silvio Rodriguez, often referred to as the ‘Cuban John Lennon’. The cast moved in and out of unison, using fluid and instinctive movement, not shying away from the individuality of each dancer. Rodriguez’ folk guitars were spliced with a contrasting atmospheric noir by Canadian Composer Owen Belton, which created such a contrast it was almost as though you were witnessing two pieces being performed simultaneously. The eponymous Acosta featured in the next work with Marta Ortega which, although hard to choose, was likely the standout piece of the evening. A new work set to live music moving from Korean songs of the sea to Eric Satie, the piece was created for Acosta and Ortega by Sadler’s Wells Associate Artist Sidi Larbi Cherkaoui. Contemporary dancer Ortega appeared as an inebriated woman, unsteady in her pointe shoes. As soon as Acosta appeared on stage, his face indistinguishable by the single spotlight on Ortega, he was instantly recognisable by his physicality; anyone who has seen Acosta perform will know well his command of the stage. Whilst this piece was led by the stunning Ortega, Acosta was resolute in enabling her to shine. The night drew to a close with the most ambitious and dynamic work of the evening, ‘Twelve’. 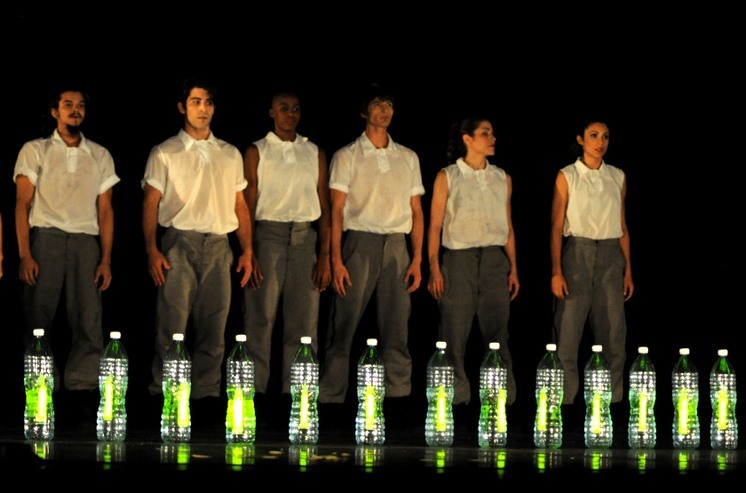 Adapted from a piece devised for EDge [stylised EDge] at the Royal Opera House in 2011, it involved twelve dancers forcefully taking over the stage throwing water bottles with glow sticks at each other. As bizarre as it sounds, the piece was intensely gripping, drawing gasps and applauds from the audience after particularly daring throws. Twelve delivered a sense of unpredictability which was masterfully choreographed in order to achieve. 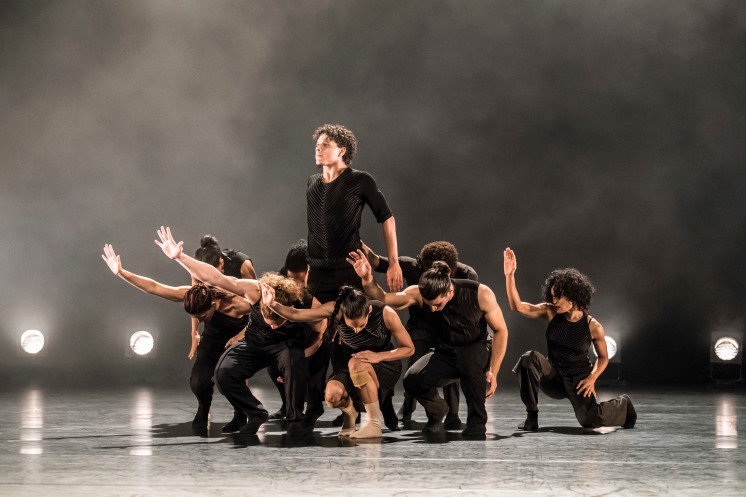 Acosta, with this UK premiere, is truly showcasing the diversity of the company, proving that the cast could master not only the classical traditions but push the boundaries of more experimental work. I think it’s safe to say that on that promise, they have definitely delivered. Following the UK premiere at the Festival Theatre Edinburgh (10 & 11 Nov) followed by international dates. More details can be found here.